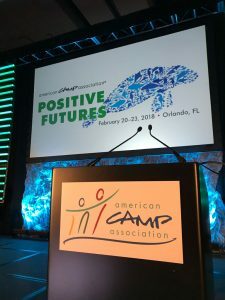 February 21, 2018 (INDIANAPOLIS, IN) – CHAMP Camp is pleased to announce its recognition for the annual Eleanor P. Eells Award for Program Excellence from the American Camp Association (ACA). The Eleanor P. Eells Award for Program Excellence honors programs that develop effective, creative responses to the needs of their campers/societal problems using the camp environment or programs which demonstrate positive contributions to the camp experience and their campers’ overall well-being. The award demonstrates CHAMP Camp’s continual efforts to provide a nurturing environment and a place for discovery, growth and independence through a variety of outdoor activities. This year, CHAMP Camp is on a mission to raise funds to build a fully-accessible treehouse at Bradford Woods in Martinsville, Ind. where more than 800 campers from various youth therapeutic camps will have the ability to reach new heights. CHAMP Camp is a non-profit dedicated to providing a summer camp experience for children and adolescents with tracheostomies and those who require respiratory assistance. CHAMP Camp started in 1991 when David Carter, a hospital administrator with a respiratory therapy background; and Nancy McCurdy, a child life specialist, had a vision of providing a summer overnight camping experience for children with special needs. Since then, CHAMP Camp has relocated to Bradford Woods, a nationally recognized facility for outdoor education and therapeutic recreation, owned by Indiana University. Every summer, CHAMP Camp’s community is home to health care professionals, volunteers, rehabilitation specialists and campers from over 15 states for an experience that encourages discovery, growth and independence. The American Camp Association® (ACA) is a national organization with more than 11,000 individual members and 3,000 member camps. ACA is committed to collaborating with those who believe in quality camp and outdoor experiences for children, youth, and adults. ACA provides advocacy and evidence-based education and professional development, and is the only national accrediting body for the organized camp experience. ACA accredits approximately 2,400 diverse camps nationally. ACA-Accredited® Camps meet up to 300 health and safety standards. Accreditation provides public evidence of a camp’s commitment to the health, safety, and overall well-being of both campers and staff. For more information, visit www.ACAcamps.org.